Mick Newport, Principal of the company, knows what hard work involves. Starting off his career as a plumber and drainer, his vision and passion for the industry has created a company that is second to none. The success of Mick Newport Contracting is in no small measure thanks to his ability to transmit his vision, enthusiasm and passion to his team, empowering them to strive also to deliver the best possible quality service to customers. Motivated by a love of excellence and innovation, Mick Newport Contracting brings to every job an expertise that transforms and transcends the customer’s vision and makes it a reality. Mick Newport Contracting sets an outstanding standard for earthworks, keeping ahead of its competition through its commitment to constantly expand its knowledge of industry standards and applying the newest technologies and processes in the earthmoving business. A feature of the Mick Newport Contracting approach is its flexibility and adaptability which seeks out and welcomes opportunities for innovation. Recognising that every job is different, Mick Newport Contracting plans every job intelligently, collaboratively and rigorously; fully engaging the involvement of each client in a partnership relationship. For Mick Newport Contracting, all feedback, whatever form it takes, is an opportunity for growing skill and improving service. Working closely with a team of supporting professionals who bring their own specialised expert knowledge and skill to each undertaking and challenge, the Mick Newport approach is living proof that the best outcomes are those built on the dynamic exchange of ideas, innovation and expertise. Quality assurance is a priority for Mick Newport Contracting. All staff are highly trained and fully licensed. Workplace Health and Safety is an imperative on every contract, every job, to protect the welfare of operators, clients and the general public. 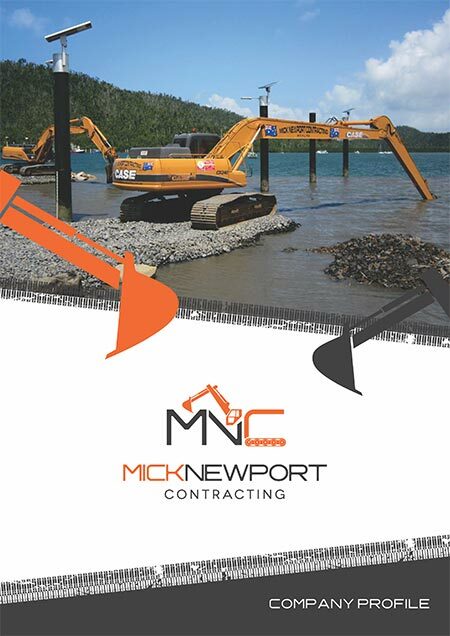 Mick Newport Contracting is proud of its home-grown origins and Australian identity, celebrating this tradition by displaying the Australian National flag on all machines in its fleet. Its vast experience on large and small scale excavation gives Mick Newport Contracting a distinctive edge on quality outcomes, making it one of Queensland’s most respected and successful plant hire specialists. Mick Newport Contracting applies a ‘whole project’ approach, undertaking a wide range of tasks itself but also sub-contracting to other respected professionals and service providers when required. Customer service is at the heart of Mick Newport Contracting’s operation. Courtesy and respect for the customer have high priority. Full customer consultation and satisfaction is guaranteed by MickNewport Contracting. Mick Newport Contracting has a well-earned reputation for its work ethic which is based on the highest authentic personal and professional principles. Mick Newport Contracting has been awarded the highest Workplace Health and Safety rating possible,thoroughly deserved by its commitment to rigorous training and workplace modelling. Mick Newport Contracting is not afraid to take on the jobs that are difficult and technically challenging.It welcomes each opportunity to innovate in keeping with its ‘Can-Do’ approach. Mick Newport Contracting recognises the importance of budgets and deadlines and is prepared to invest the working hours necessary to achieve quality outcomes within these parameters. Mick Newport Contracting is on call and available 24/7, earning the company a rightful first place when emergency work arises. Mick Newport Contracting works with a diverse range of customers including the farming community,Industry, Construction, Local and State Governments, Property Developers and private individuals. No job is too small or large. Mick Newport Contracting embodies a non-negotiable commitment to the care of the environment in this World Heritage and Wet Tropics region. Ensuring that the work undertaken has the smallest environmental footprint possible is a high priority in principle and in practice.